How can I make VirtualBox guests share the host's VPN connection? When I start my VPN on my ubuntu desktop computer which acts as a router, the attached subnet loses internet connectivity, but is still accessible (LAN). Ideally, I would like to know how to enable the attached subnet to re-gain internet access by routing through the VPN tunnel when the VPN is active. subnet 172.16.0.0/20 on eth0 for my VirtualBox virtual machines. subnet 192.168.0.0/24 on eth0:0 which connects to gateway 192.168.0.1 which has internet access. The packets on the eth0 are forwarded through eth0:0 with masquerading and normal internet connectivity is fine. However when I start my VPN tunnel on this router, internet connectivity is lost for the VMs on the eth0 subnet (yet remains for the router). Since your virtual machines are using eth0 directly, they are unaware of the tun0 interface to the tunnel running over it. You will need to use a different virtual networking configuration. Network Address Translation (NAT) is by far the simplest solution. VirtualBox will NAT the VMs across whatever internet connection is available to the host. This is fully transparent to the VMs. However this precludes connections from the host to the VMs or connections between the VMs. Use Host-only Networking to create a proper subnet containing the VMs and the host. This will require no changes in the interface configuration you now have in the VMs, but you will need to set up the host to be the gateway and router, and make it NAT the VMs to the outside (whether across its eth0 or tun0). Combine the above: give each VM two interfaces, one gatewaying to the outside world (across VirtualBox's NAT) and the other attached to the Host-Only LAN. Try VirtualBox's experimental NAT Networking configuration. I haven't looked into that, but its description suggests it might be just the right fit. 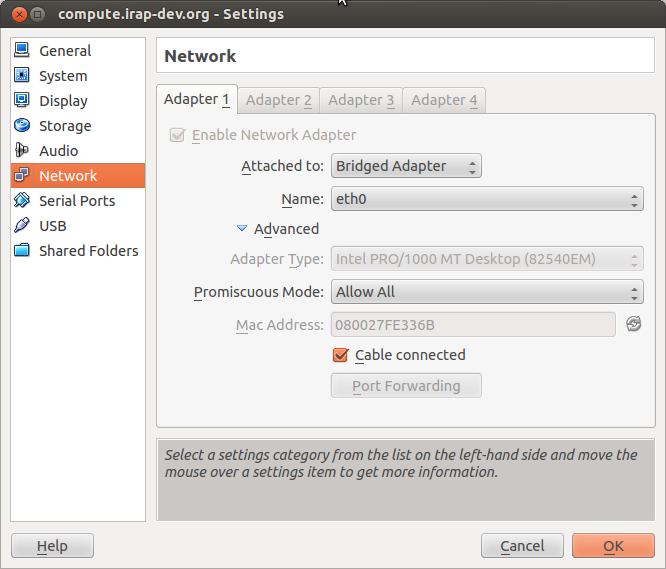 For VirtualBox with windows host and linux(mint) guest, go to the Network UI tab and set for "Adapter" => "Attached to : NAT" and "Adapter type : Paravirtualized network". After that start your VM and you should be able to use VPN network. Change the network type of Guest System to be "Host Only"
Make the default gateway of Guest point to Host's ip ifconfig vboxnet0 to find it. Last step is routing the packets coming from vboxnet0 into your VPN. Where 10.8.0.5 is your tun0 gateway and 192.168.5.0/24 is your vboxnet0 network range. Where 10.8.0.5 is your tun0 gateway and 192.168.43.95 is your wlan0's gateway and 192.168.5.0/24 is your vboxnet0 network range. Note: This solution allow Guest OS be treated in same way Host OS is treated. Only IPs configured to go through VPN in Host OS will go through it in Guest. Here is some useful info for vagrant boxes using host vpn. Basically you need to set natdnshostresolver1 option Note that this will NOT work when using the Vagrant's public_network setting though. Not the answer you're looking for? Browse other questions tagged networking vpn router routing tunnel or ask your own question.